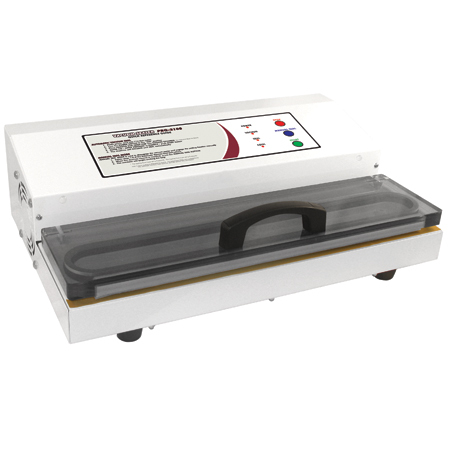 Preserve foods 5-6 times longer than traditional methods with this commercial grade vacuum sealer featuring an extra large teflon bar for sealing bags up to 15 inches wide. Double piston vacuum pump delivers 28" HG vacuum strength with 935 watts of power. Easy to use, bright LED light lets you monitor the stages of the sealing process. Includes automatic mode with one touch operation. Let the onboard computer handle the rest, from vacuuming to sealing. Manual seal mode lets you customize and control the amount of vacuum pressure desired for soft foods or delicate objects. See thru acrylic lid for perfect bag alignment while sealing. Fan cooled motor. Detachable power cord and convenient storage compartment.